This week has been jam packed with all kinds of amazing recipes to make for Mother’s Day brunch or breakfast! This next recipe is no exception. 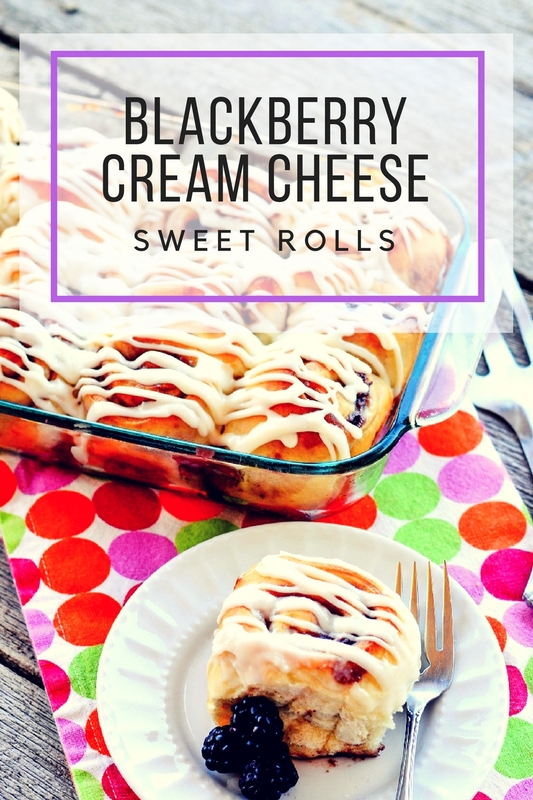 Because I love bread and sweet rolls this recipe for Blackberry Cream Cheese Sweet Rolls are amazing! You need to plan a little time to make this recipe but it is a total winner. From the tender dough to the creamy goodness of the filling there is nothing you wont like about these sweet rolls. I put the frosting in a piping bag just so it would not be as messy but using a spoon to drizzle it on the top of the rolls is just as effective! 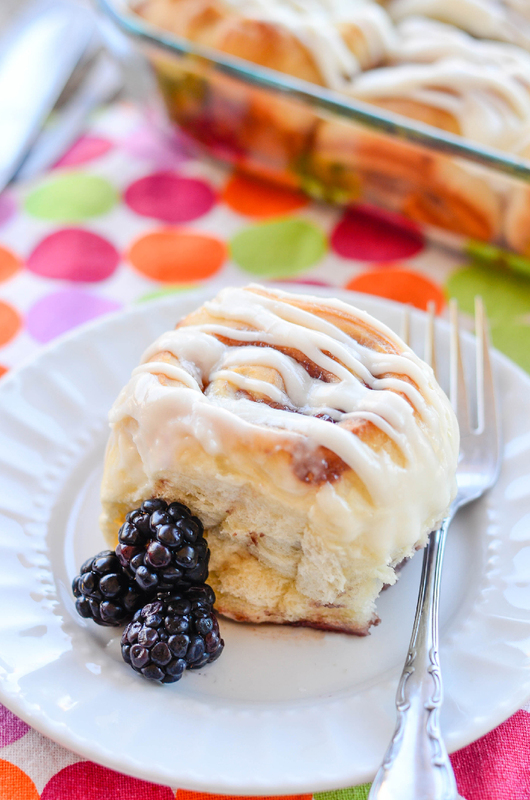 The fun thing about these rolls is you can change the jam you use. If you like strawberry then use strawberry, if you like orange marmalade use the marmalade. I want to make an apricot version I think that would be amazing! In a large bowl (to allow for about 7-8 cups of dough to double in bulk), whisk together the flour, yeast, sugar and salt. Make a well in the center of the dry ingredients. In a 2-cup liquid measuring cup, whisk together the eggs and pour them into the well. Use the same measuring cup for the hot water. Pour it around the edges of the well (not directly on the eggs) and then add the melted butter to the bowl. Use a large spoon to mix the ingredients together until a soft, rather wet dough is formed. It won't look like traditional cinnamon roll dough; it will be much softer and it's ok if it looks a bit lumpy. When ready to roll out the rolls, prepare the filling: in a blender or with an electric mixer, whip the cream cheese, powdered sugar and lemon zest together until smooth and creamy. Using about 1/4 - 1/3 cup flour, dust a clean counter top. Lightly punch down the chilled dough and roll it out on the floured counter to a long, skinny rectangle (about 24-inches long and 7 or 8-inches wide). Spread the cream cheese mixture on the rectangle, spreading evenly with an offset spatula or knife. Dollop spoonfuls of jam across the top and spread into a somewhat even layer. 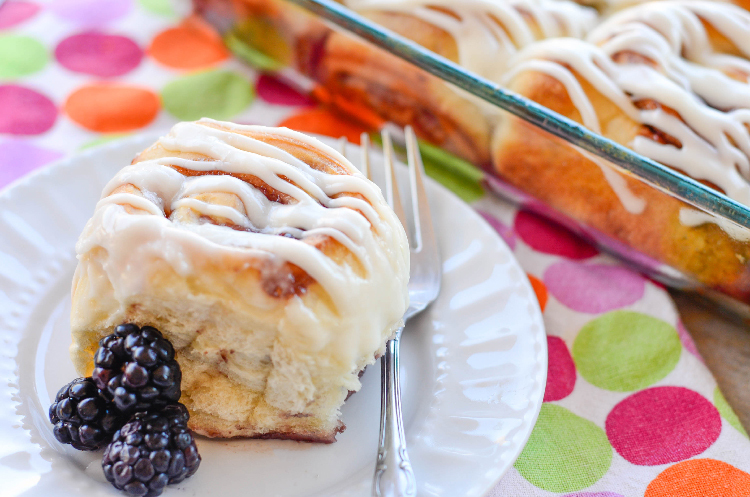 The more jam you use, the messier the rolls will be to twist. Starting at the long end of the rectangle roll the dough to create the sweet roll. When done rolling pinch the edge to seal. Cut into 2" slices and place in pan sprayed with cooking spray.Cover the pan with greased, plastic wrap and let the rolls rise until doubled in size, an hour or so. Bake at 375 degrees F for 12-14 minutes until just barely golden on top, do not overbake. For the glaze, whisk together the powdered sugar, butter, milk, and vanilla. Add more milk as needed until the glaze is thick but pourable. Let the rolls cool for 5 or so minutes before drizzling with glaze. 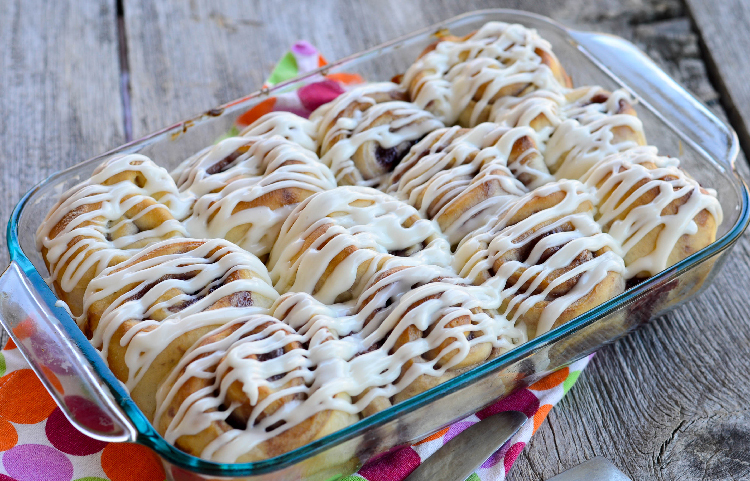 Now lets take a look at what the other Brunch Week Bloggers are making today!